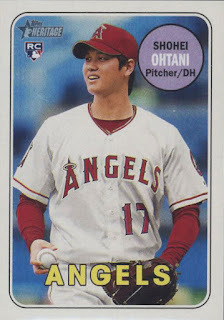 Go figure that it would be another Ohtani as my favorite card of the year but the relatively healthy half of him lived up to the hype and I wanted to showcase my best rookie year card of his - the traditionalists who have collected Topps Heritage for years may not like these short print gimmicks because it gets in the way of completing their sets. However, the Action Image variation cards picturing prominent rookie or second year stars have gotten popular to collect - even if it wasn't autographed, in my mind an Ohtani was a definitive card to have. Nice card. It was nice to see him take home the AL ROY Award. Hope that elbow injury doesn't slow him down too much during his career. I agree with Fuji. That injury was a bummer, because I'm so very intrigued by the two-way player.